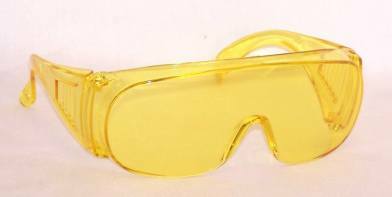 ANSI Z87 Vestas 2 Safety Glasses Amber Yellow Lenses, yellow temples. Shatter resistant, polycarbonate lenses that shield 99.9% of UVA and UVB light. Zero distortion lenses. Precision engineered to provide superior visual clarity. Traditional looking style with side shields. Frame-less. Large lenses, rounded near the temples. Sized to fit over most prescription lenses. Tall temple area for extra protection. Ventilated temples. 6" width from temple hinge to temple hinge. Molded-in nosepiece. Eyelet holes on temples tips for use with breakaway glasses cord (not included). Uncoated lenses. Meets ANSI Z87+ safety standards. .